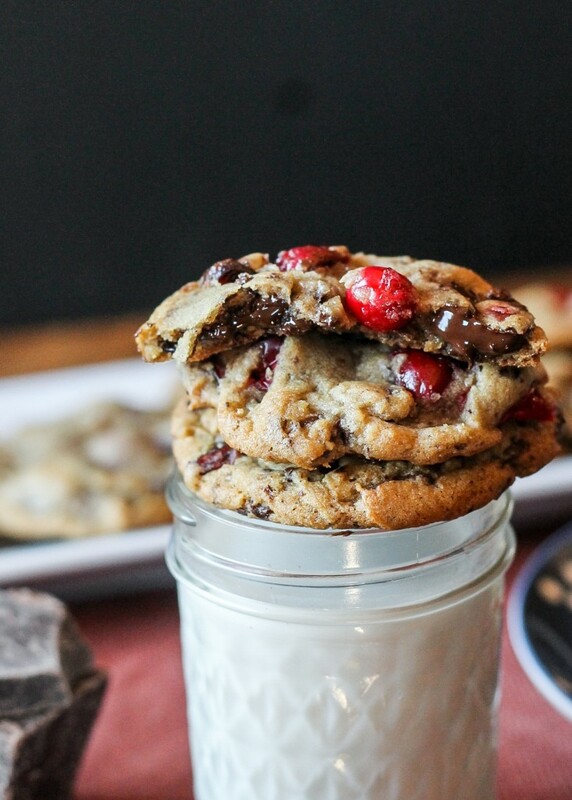 These Double Cranberry Dark Chocolate Chunk Cookies feature a browned butter and nutmeg dough loaded with chocolate chunks & cranberries, both dried and fresh! The fresh cranberries add a tart bite to a chewy, richly flavored cookie. They’re the perfect addition to your holiday cookie platters! Cranberries are a symbol of winter. The festive, cheery red color, the sweet sauce (hopefully homemade) that gets slathered all over your Thanksgiving dinner, and the piles of bags of cranberries that you see placed at the front of the produce section of the market, basking in their 15 minutes of fame, until Christmas passes and they’re replaced. And this year, prepare for cranberry overload, because I’ve been having too much fun playing with cranberries in the kitchen! I’ve always adored the tart, sweet bite that cranberries add to any dessert, and I’ve always fondly remembered how much I loved these browned butter cranberry lime muffins that I made way back when Bakerita was only a few months old. The tartness of cranberries adds a flavor to dessert that I find absolutely enticing, and if you’ve never tried it, well…you’re in for a major treat. The dough for these cookies is a favorite. We start with some browned butter (invite your friends over because your house will smell amazeeeee), make the cookies ultra chewy and caramel with tons of brown sugar, and make the whole thing extra special with just a hitn of ground nutmeg. The nutmeg is subtle, but there, and highly recommended. It adds an extra hint of holiday warmth and comfort, and pairs beautifully with the browned butter and the cranberries. Now, we add double the cranberry. Fresh, bright cranberries as well as chewy, dried, sweet cranberries are added to the dough, along with chunks of dark chocolate. Fresh cranberries add a gorgeous shock of red color to any dish that they grace, and I love how that pop of color adds some lively festive cheer to these cookies. If you’ve been around Bakerita a bit, you know I love to chop my own chocolate for cookies instead of using chocolate chips, but do what’s most convenient! If you’ve never tried chopped chocolate though, I highly recommend it. Chocolate chips use a wax to help them hold their shape, which inhibits their melty-ness. Using chopped chocolate, the chocolate in the cookies will stay soft and gooey, just the way I like it! These cookies disappeared off the plate in record time, and were a major house favorite. The cranberries make for an unexpected, but most definitely welcome addition to the cookie party. 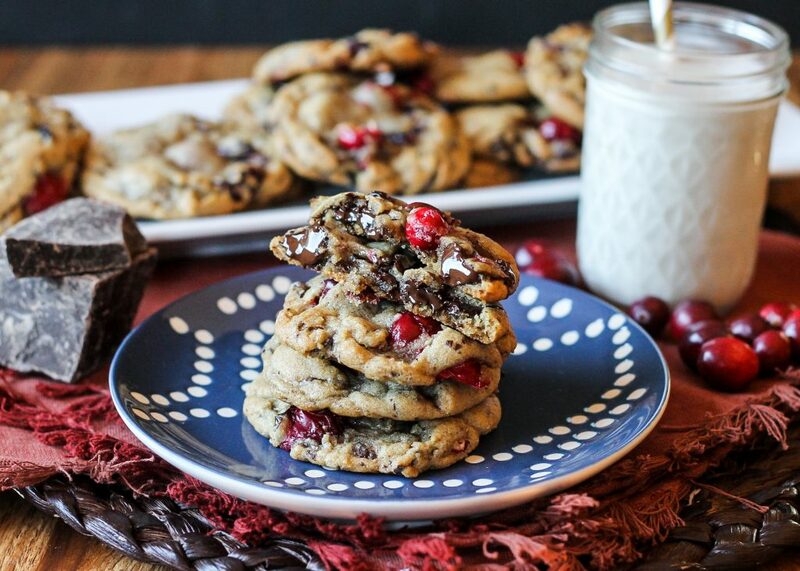 These Double Cranberry Dark Chocolate Chunk Cookies are perfect to make an appearance on your cookie platter this holiday season, or simply to share with family and friends and bask in a little holiday love. Enjoy! In a medium skillet, melt butter over medium-low heat, stirring nearly continuously. Butter will melt, then begin to foam. It will then begin to turn golden brown and smell nutty. As soon at the butter begins to turn brown, take the pan off the heat, and continue to stir for about 1 minute, to ensure carryover heat doesn't continue to cook and subsequently burn the already browned butter. Transfer the browned butter to a small bowl, making sure to scrape the sides of the pan to get ALL of the butter. Cover with plastic wrap and place in the fridge for 30 minutes, or until the butter is mostly solidified but still soft. Add the butter to a large mixing bowl. Add the sugars, and cream the butter and the sugars until fully combined, about 5 minutes on medium-high. Scrape down the side of the bowl. Continue mixing and add the egg. Add the vanilla. Scrape down the bowl with a spatula. Combine the flour, baked soda, nutmeg, and salt in another bowl with a whisk to combine. With the machine on low, slowly add the flour mixture. Mix until just combined, taking care not to over mix. The dough may be slightly crumbly. With a spatula, fold in the dark chocolate, dried cranberries, and fresh cranberries. Refrigerate dough for at least one hour 1 hour, or up to 5 days. Use a medium-sized cookie scoop to form cookies. Bake at 350ºF for 11 minutes, or until lightly golden brown. 12/13/14 Recipe Update: The amount of flour in the recipe was reduced from 1 3/4 cups to 1 1/2 cups to solve the issue of crumbly dough that some individuals had. This change should mitigate that issue. Enjoy this post? Check out some of my similar recipe favorites! Love the combo of fresh and dried cranberries with chocolate – sounds delicious. This is a perfect treat for the Thanksgiving holidays, Rachel. Looking forward to making these. Thanks! Help! These cookies are way to dry and crumbly to form or keep together on the cookie sheet. Anything I can add to save all this dough? Hi Rhonda! An extra egg yolk will help hold the dough together if you’re having issues. 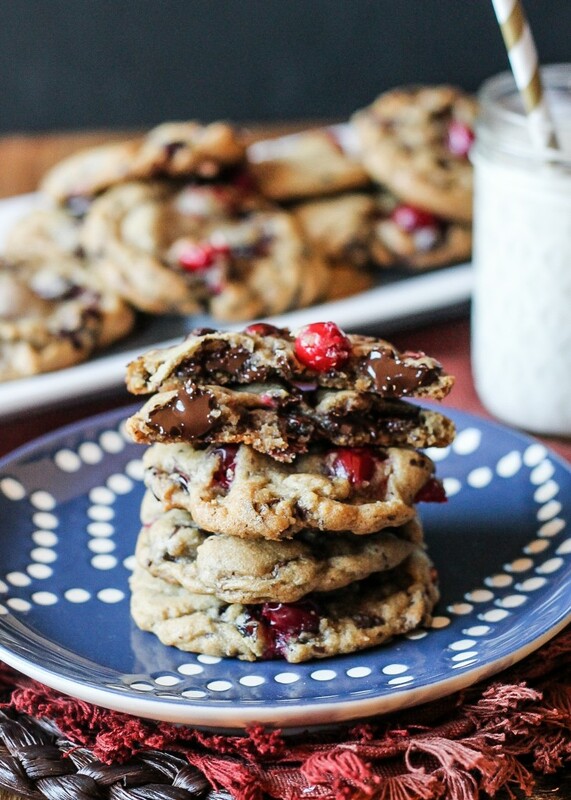 These look amazing, cranberry and dark chocolate is such an great and bold flavor combo! I can’t wait to give these a try! OK 4 more words: Can I have one??? If I had any left…I would most definitely give you some! Next batch I’ll share :) thanks Debi! Amazing. These look so yummy! I must try these soon! Thanks. I just started baking with cranberries, too, and I absolutely love them! These chocolate chunk cookies look fantastic, Rachel! I love the addition of cranberries and dark chocolate. Sounds perfect! I totally agree that it’s best to chop your own chocolate for cookies and cakes. These look just so deliciously packed full of oozy chocolate – now that’s what I like to see inside a freshly baked cookie! And the cranberries just make them all the more perfect for the holidays! These look SO good. I have recently developed a cranberry LOVE. Great recipe! OH MY GOSH!!!!!! WHAT JUST HAPPENED?!?! AM I IN HEAVEN? Seriously those look incredible and amazing and all of things I am craving while stuck in the house on a cold winter day!!! Oooo I love these cookies! I just made biscotti yesterday with fresh cranberries and dark chocolate and it is suchhh a good combo! These look amazing! And awesome pictures! I am drooling over here with these cookies. I also have never chopped my own chocolate for baking so I am going to try that next time. Is there a brand you like the best? So glad you like the cookies, Lauren! I use whatever I have on hand, usually Pound Plus bars from Trader Joe’s or chunks of dark chocolate from the bulk section of WinCo. Ghirrardehli is a good option that’s available at most grocery stores but can get a little pricey. I experimented a bit with the options I had available until I found my favorites. I would recommend staying away from “candy bar” chocolates though, like Hershey’s. Most brands will work, it’s just finding your favorite! Oh snap I think I found an addition to my cookies baking days. Thanks for the inspiration. Pinned! These look soo super delicious! And great pics too! These look delicious! :) There’s just something about the cranberry-chocolate combo that reminds me of the holidays! Holy YUM! I am SO MAKING THESE for Christmas, if not sooner! they sound amazing! Thank you for sharing! These cookies look unreal! I love the chocolate cranberry combo! Wow. I’m not sure I could manage the whole, fresh cranberries (tart!!). But the rest of it – literally mouth-watering! Thanks, Celeste! The cranberries aren’t too tart once they’re baked and with the rest of the cookie dough. You should try it! When I saw these on your FB page, I knew I had to try them! O love cranberries! The cookies look great and will be perfect for the holidays! I absolutely love that you threw fresh cranberries in there! I’m excited to try that soon. I’m always using dried, but this looks awesome. Oh my those cookies look so good. Love love love the fresh and dried cranberry overload! Thanks for reminding me that I don’t use cranberries NEARLY enough. These look like the most perfect holiday cookie yet. Those look delectable! 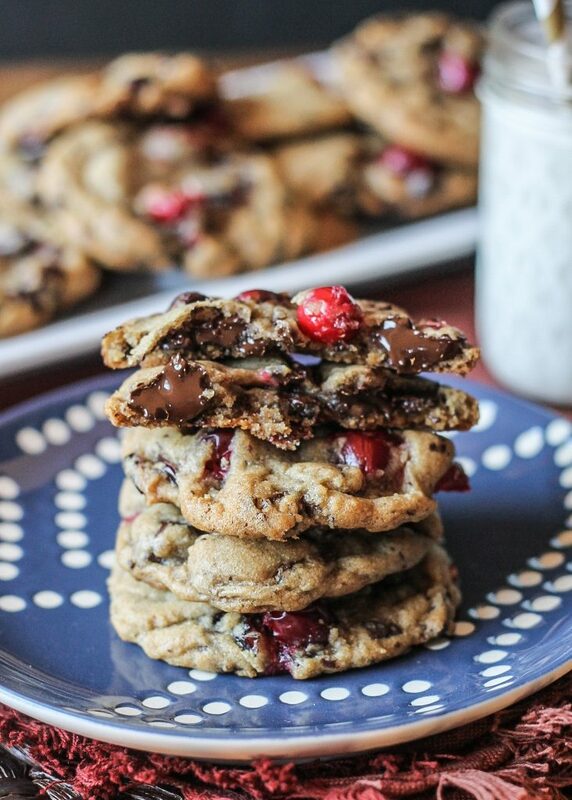 Chocolate, cranberry, and in a cookie?! Loaded to the brim with deliciousness!! These cookies look way too good. I would not share one! OMG! Those look so yummy! 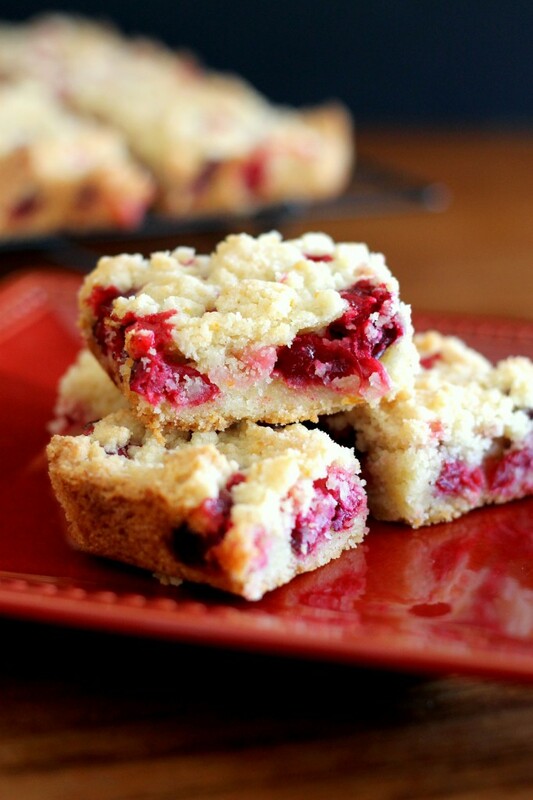 Love that you used fresh cranberries! These look incredible! Omg these are just completely drool worthy! They look so delicious. I very nearly almost licked the screen just then. Nearly. Ok, maybe I did. Only a little. Such a perfect use of fresh cranberries! Bet they’re amazing mixed with all that melty chocolate! Thanks, Natalie! You should definitely try it – I only use chocolate chips occasionally now. It such a minimal amount of extra effort, but I think the difference is worth it. Yum! I love seasonal flavors like cranberry and apparently we all need to eat more chocolate! OH MAN!! These look amazing!! PERFECT Christmas recipe! I love it and NEED these tasty treats in my life :) Great recipe girl!! Oh my holy heck Rachel. These look freakin amazing. You literally just combined all of my favorite things. ALL OF THEM!!! i love you. PS totally didn’t even know that about chocolate chips. I need to chop! Woah! These babies are packed! So much chocolate! Love it! These cookies look AMAZING. They definitely are going on my Christmas baking list.. Pinned! YUMMMM! These are like melty, heavenly goodness! Oh my goodness. Those cookies look so delicious! If I made these, I don’t think they would make it to a cookie platter! I would just stuff my face with cookie! If only I can reach through the computer and taste just one. These look fantastic. The moment I saw these cookies on IG the other day, I was like ‘welp, forget about diets—I just wanna eat these cookies every day for the rest of my days. :D Swooning over all that dark chocolate goodness! These cookies would remind me of yumminess. These look sweet and tangy and gooey and amazing! I love that you added fresh cranberries, I never know what to do with them as I always have so many! 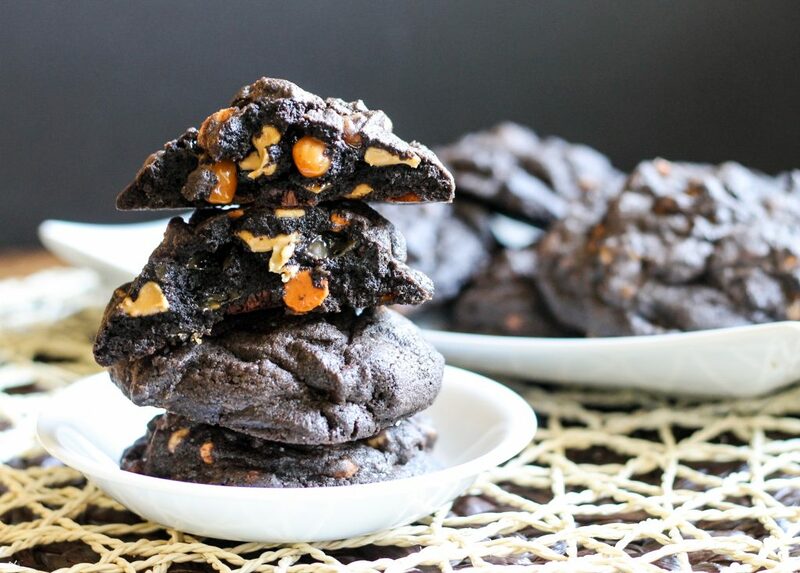 Your cookies always look so amazing and these are no exception! Double cranberries plus dark chocolate? Yum! stop it just stop it! these look ah-maz-ing! These are almost too pretty to eat. i want some now! I can’t wait to give them a try myself. Oh my gosh! These are like a plate full of Christmas! I love everything about these! What a compliment! Thanks so much, Olivia. love these cookies!! anything that starts with browned butter is a-ok by me!! so festive and love love the fresh cranberries! so pretty!! Yes! These look so good. 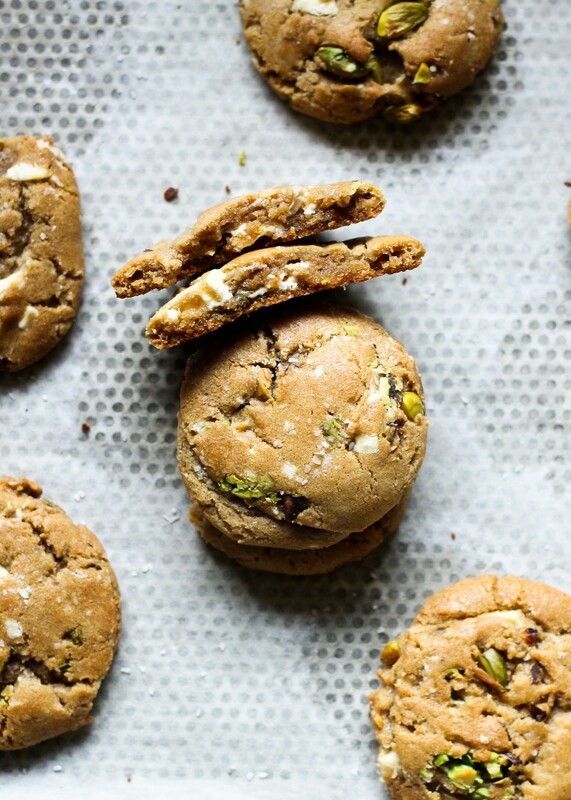 The brown butter in these cookies must really kick the flavor up. Those cranberry pieces really make this cookie look divine! Yum! Looooove these! I am a big dark chocolate/cranberry fan! They look fabulous..love how thick and soft the cookies are! Pinning. These cookies are gorgeous! Love cranberry and dark chocolate together! So perfect for the holidays! Hello! I made these this afternoon. The dough was very loose and didn’t form well. It really wasn’t sticky. Is this how it’s supposed to be? Hi Kristin. The dough isn’t supposed to be sticky necessarily. I’m not sure what you mean by loose, was it too wet or too dry? Sorry I can’t help more – I just need a few more specifics! I guess too dry? It was difficult to get the dough to form and hold into small balls. The still taste delicious. I’m hoping to make them again, so just wondering if I did something wrong! I made slightly large cookies, so maybe that could have been the problem. You can try making them bigger next time! Also, because they have so much stuff loaded in them, dough can get crumblier. Oh, and make sure you aren’t using too much flour! If you don’t have a kitchen scale, gently spoon the flour into the measuring cup and then level so the flour doesn’t get packed in. Hope this helps!! Glad to hear that! Thanks for commenting and trying the cookies, Kristin! Um WHAT. I just licked my computer screen. I’ve been playing with cranberries a lot too and I just can’t get enough of them! These cookies look soo good and they are filled with some of my favorite things! I love brown butter everything! These look incredible! Rachel these look incredible! I have some fresh cranberries just begging to be used up, and I’m a newly-initiated brown butter lover. These cookies just have to happen soon! Pinning! OH. MY. GOSH. These look AMAZING! Definitely saving this recipe for later! :) YUMMY! I may have just licked my computer screen… jeepers those look delicious!! I’d never seen so much cranberry in everything everywhere until this week. (I moved to England from Spain in April.) I like it and I definitely understand it in cookies and muffins and whatnot, but I’m both intrigued and a little terrified by the thought of cranberry sauce on savory meals, lol. This is my first time stopping by your blog(and definitely not the last time!) I’m with you about chopping up my own chocolate for cookies: it’s so much better!Happy Thanksgiving! Thanks so much, Matea! I hope you’ll be back again and again. Chopped chocolate is definitely my go-to :) Happy Thanksgiving! All of my favs in ONE thing! Yum! How many does this recipe make, trying to decide if I need to double it. Thanks! Hi Catherine! This makes about 18-24 cookies, depending on how big you make them. I ended up with 18 using a large cookie scoop. Oh my gosh these look amazing!! I’ll have to paleo-ify them for me since I’m allergic to gluten but LOVE the idea!! Thanks so much Dana! I hope they turn out just as deliciously GF! These look amazing!! Can’t wait to try them! I want to make them for a holiday cookie swap–can you tell me how many cookies this recipe makes (or did I miss that somewhere)? Thanks! Hi Lynn! I got 18 cookies from this batch using a large cookie scoop. You may get a few more if you use a smaller scoop. I hope you (and whoever receives them) love the cookies! OK, most of the posts talked about the beautiful photos and how wonderful these must taste. Did anyone actually make them and follow the recipe? I did and I’m a pretty gosh darn good baker and the dough is unbelievably crumbly and impossible to work with. NEVER AGAIN and they were expensive to boot! Hi Kathy, I’m so sorry you had trouble with the recipe. I’ve made it a few times and have had a few friends make it, and haven’t had any issues. The dough is a bit on the crumbly side because of all the add-ins, but it should have stuck together. Did the cookies not taste good? I’d love to help figure out what went wrong. I had the same problem. The dough was so dry that I couldn’t shape the cookies at all (even after putting it in the fridge for awhile.) I tried to save it by adding a bit of vegetable oil, but it didn’t help. Maybe the measurements for the butter are off? Hi Lee, I’m so sorry the recipe didn’t work out for you! Did you weigh out your flour? If your flour was too tightly packed in the measuring cup when it was measured, it could definitely make the dough too dry to work with. If you don’t have a scale, I recommend the scoop-and-level measuring method. I’ve made this recipe numerous times with this amount of butter and haven’t had any issues, so I’m not sure if that would be the cause of the issue. I had the same problem. They’re so good, though, I had to make them work. Enter: the mini muffin pan. I packed the dough into 48 wee cups (minus some that had to go to testing, obviously), baked them until they were lightly brown – which was super quick – and drizzled them with melted chocolate. They are wonderful and the dough is much easier to work with. Hope to help out my fellow crumbly dough people! Thanks for this tip, Sarah!! Sounds like a great solution to the problem. I’m going to play with the recipe a little bit to try and make the dough less crumbly, but I’m glad you figured out a way to make it work and enjoy the cookies. Happy holidays! These cookies look amazing, so I made them for the first time for a party just now. Unfortunately, if you follow the recipe based on cups for flour (1 3/4c. ), it’s far too much and the dough ends up being completely crumbly – I couldn’t even get a ball to form. I had to have my husband sift out the chocolate chunks and cranberries while I try to quickly whip up another batch using the weighing method (which makes the flour to be about 1 1/2 c.). We’ll see! I’m looking forward to the 2nd batch! Hi Tammy, I’d love to know how the second batch turns out! I may need to adjust the measurement in the recipe, so I’d love your feedback if that change made the dough more cohesive. I made the second batch and they came out fantastic! I reduced the flour down to 1 1/2 cups and kept everything else the same. Perfect! The nuttiness of the browned butter made them taste even better. They were a hit with my entire family and I’m sure they will be for the party, as well! Thank you! Awesome! I’m going to adjust the recipe to 1 1/2 cups flour, thanks for your input. I always measure by weight, so my mistake that the volume measurement wasn’t correct. So glad you liked the cookies, Tammy. I just tried this. When I combined suger and butter cream, fullyness never happened to me as if there was not enough butter. It was very crumbly. So even after mixing the flower mixture also turned out to be dry/crumbly. Taste great with fresh cranberries. I enjoyed the contrast of sweet/tangy/salty. Hi Michelle, I’m sorry you had issues! I actually just adjusted the recipe yesterday so reduce the amount of flour to 1 1/2 cups, which should make the dough less crumbly. You also need to ensure you scrape the sides of the saucepan to make sure you get all the butter out. I’m so glad you enjoyed the flavors though! I made these (using the weight for measurements) and didn’t get creaminess when combining the butter and sugar – I didn’t see how it was possible! I proceeded with the recipe and added the egg, and from there on I was able to get the right texture. The end result is fantastic. Hi Marissa, it does take a few minutes for the mixture to get creamy. I’m glad the recipe turned out well for you. Thanks for commenting, happy holidays! Great Recipe! Is there anyone out there that knows if it is possible to add cocoa to the recipe for even MORE chocolate without changing the chemistry of our cookie? Hi Ryan! This recipe will be a little tricky to convert, but if you want the same flavors in a chocolate cookie, I recommend using the recipe for my Loaded Dark Chocolate Cookies, but replacing the butterscotch, PB & caramel chips with the dried and fresh cranberries. Enjoy! Awesome! So glad to hear you enjoyed the cookies, Cosette. Thanks for commenting! Happy holidays! Wonderful recipe. These are in the oven right now and looking marvelous. I used all fresh cranberries (3/4c), half the recommended amount of sugar, added 1/2c chopped walnuts and a little extra freshly ground nutmeg (1/2t). I also did not wait and chill the dough. Above all ingredients, I can smell the brown butter most. Might even go for a little more nutmeg next time. Thank you!! Hope you love them, Mariah! Isn’t brown butter the best? !